The best month of the year is almost here! It’s almost November!! In November I’ll go white water rafting and teach a four day week and a three day week. I’ll eat Thanksgiving dinner with American and Dominican friends and I’ll turn 25!! In November I’ll go to the movie theater and watch Katniss discover District 13. In November I will write 50,000 words about a boy named Hark because November is Novel Writing Time, baby, and I’m all geared up and ready to go. Last year was my first time participating in NaNoWriMo and at the start of the month I had a little over 1,000 words typed up in a Word document about this girl named Grayson and this boy she loved named Finn and this adventure they had together and apart. I also had a 7-noon teaching job and three tutoring students. That month I also had like, 100 cats to take care of and a birthday to celebrate. But despite all of my unpreparedness and all of my other responsibilities, I did it! I wrote over 50,000 words about a girl named Grayson. Then, in January, I read it all and decided to keep about one third of it. So now it’s November again and I have about 1,000 words typed up in a Word document about this boy named Hark and this place he loved named The Clearing and this adventure he had. I also have a full time teaching job and two tutoring students. I don’t have any cats to take care of (you know, technically) but I do have a birthday to celebrate and books to read. I also have a book to work on because Grayson is far from finished telling her story and I’m far from giving up. But I am going to do it! I am going to write at least 50,000 words about Hark, who lives in the same world as Grayson and in the same time but in a different Settlement. He is gentle and hard-working and stubborn and good and I’m excited for him to show me his home this month. I still have a week to prepare and I’d like to attempt some loose outlining. I might also start in on the first chapter or so since I’ll be spending November 1 and 2 in the mountains white water rafting and drinking coffee with friends. This year I’m also planning a writing retreat during a three day weekend (hooray Dominican Constitution Day) back to the mountains (why go new places when the old places are so wonderful?) for some hard working alone time. If I’ve learned anything since this time last year it’s that the only thing I really have to learn is to trust my gut. To write the words I’d like to read, to write the words I feel good about putting onto a computer screen. I’ve spent a lot of time since the last NaNoWriMo searching for someone who could tell me how to do this writing thing better and when they all told me to just write the darn thing I thought that surely there’s something I’m missing. But there isn’t. I just have to write the darn thing. And then read the darn thing and rewrite and fix the darn thing. Until it’s done. I’ve said it so many times my friends are tired of hearing it but I will finish a novel darnit! And my personally assigned deadline for a finished, readable, self-publishable novel is June 2015. So true! Write and rewrite and rewrite again. Just keep working away and it will happen. I so hope to be able to tell you more about them in the future! Thanks for reading!! Well, here I am and if I wasn’t red enough from the heat here in Australia, I’m blushing at being quoted! Thanks so much for the link and quote! Good luck with the writing and I’ll be sure to check in and make sure you’re on task! I’m exciting reading your post! In all honesty, I hated everything I wrote… until I hit the end. Then it doesn’t matter about all those words that need cutting, or what sleepless atrocities you’ve committed. What matters is at that point it’s called editing! Good luck! Thanks for reading and commenting!! The best thing about the internet is that I get to hear about the different writing journeys of so many people who are going before me and it makes it that much easier to follow in the wake – to just write! We totally got this!! I’d like to think we’ve got it! Still a few more days of planning ahead! I always enjoy heading over to a fellow blogger’s corner of the web and always try and comment if I swing by because I know how good it feels to get one! 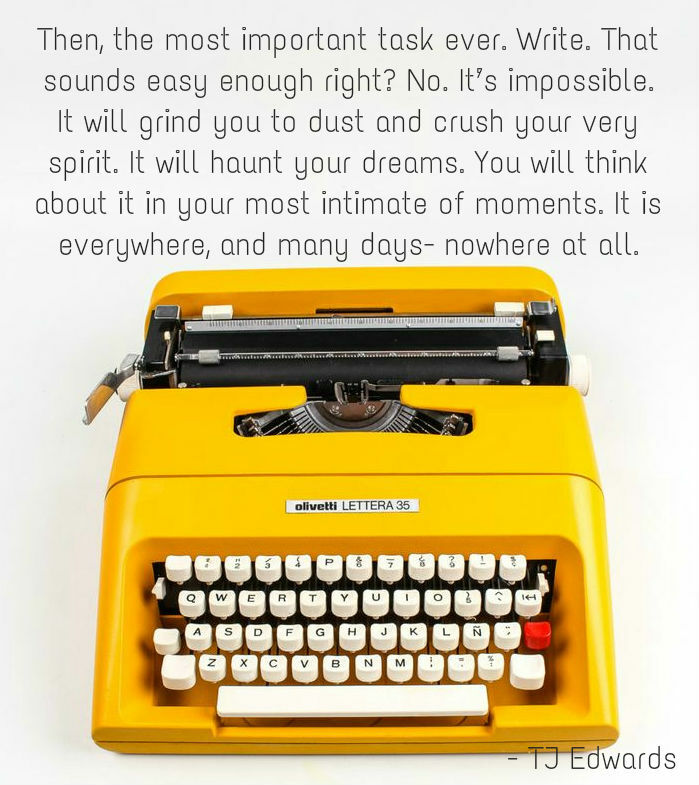 Take care for the NaNoWriMo cometh! OMG! I didn’t know about NaNoWriMo. I had heard the name in some youtube videos, but I never got what it was all about. I just entered the page and I’m all crazy about it!! I’m gonna do it! Well, I already started it, haha, but I’m gonna reach those 50,000 words this month. It’s a really exciting thing to do. I wish you the best. It seems that you’re going to have a great november! Do it, do it!!! I found out about it at the end of October last year and I had already started a story, too. It was just what I needed to keep writing.